This is Thomas Nast's earliest published picture of Santa Claus. Nast is generally credited with creating our popular image of Santa. 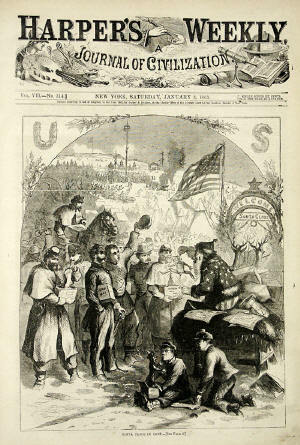 This illustration appeared in the January 3, 1863 edition of Harper's Weekly, and shows Santa Claus visiting a Civil War Camp. In the background, a sign can be seen that reads "Welcome Santa Claus." The illustration shows Santa handing out gifts to Children and Soldiers. One soldier receives a new pair of socks, which would no doubt be one of the most wonderful things a soldier of the time could receive. Santa is pictured sitting on his sleigh, which is being pulled by reindeer. Santa is pictured with a long white beard, a furry hat, collar and belt. We can see that many of our modern perceptions of Santa Claus are demonstrated in the 140 year old print. Perhaps most interesting about this print is the special gift in Santa's hand. Santa is holding a dancing puppet of none-other-than Jefferson Davis, President of the Confederate States of America. The likeness to Jefferson Davis is unmistakable. Even more interesting, Davis appears to have the string tied around his neck, so Santa appears to by Lynching Jefferson Davis! This is a classic Thomas Nast illustration. This is Nast's first published picture of Santa Claus, and we can see many of our present images of Santa demonstrated in this Civil War illustration.